…Here in Kentucky, that is. We’ve had a very busy week thus far tapping trees and gathering sap. The weather has been so lovely this week that all of the work we’ve been doing felt more like opportunity than toil. I would have to recommend not tapping sugar maples if you don’t like a few sore muscles and smelling intensely of wood smoke. 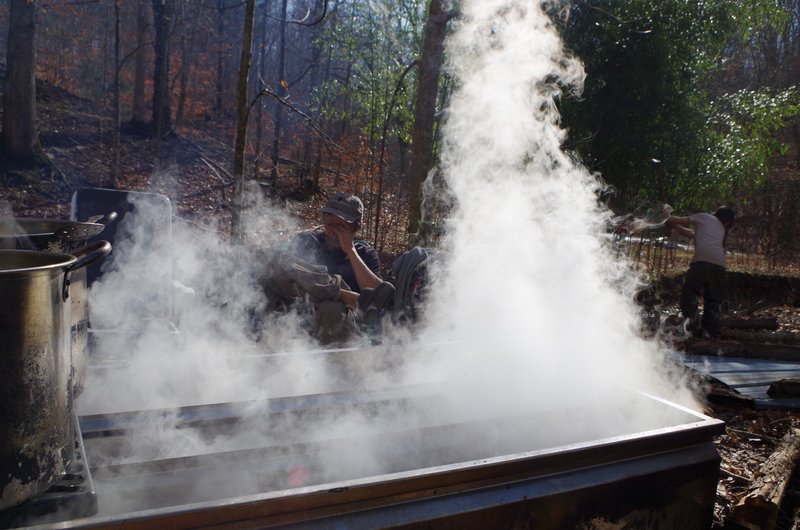 Today was our first boil-off of the sugaring season and to say that I am tired might be an understatement. We must have boiled off about 100 gallons of sap today. The 2-3 gallons that did not evaporate into thin air are now finishing on the cookstove in the house. I’m not sure I can see the task to completion this evening as the darkness has long since settled and I was dressed and out the door at 3:30 am this morning. (I have to add here that Eric was up at 2:45 am and had the fire raging before I even arrived on the scene!) Plus, we will be firing the rig again in the morning, and, looking at the clock and calculating the number of hours between now and then… well, I don’t see a whole lot of sleep in my near future. That’s ok, though. Maple syrup seems worth the effort. In particular, maple syrup that comes from trees that are like family to me. 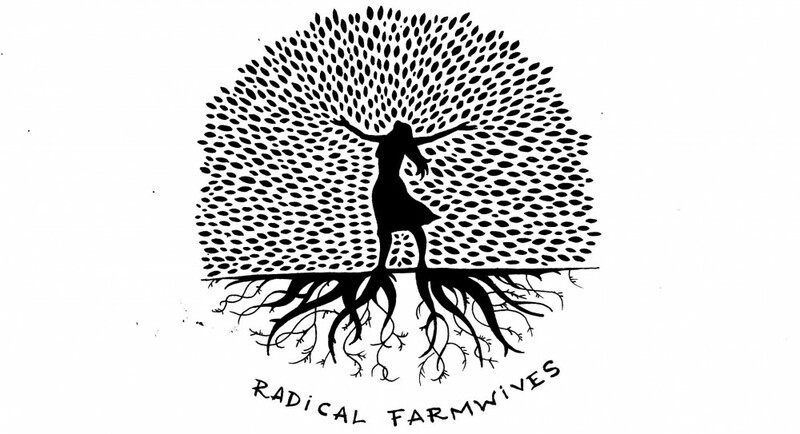 Trees that have become interwoven into the fabric of my life here on the farm. Trees that loom in the backdrop of my every day existence, no matter what the season. Trees that my children are beginning to identify as individuals and as good friends (that have pocketfuls of sweet candy). I live in a forest full of sugar maples and feel incredibly lucky for that fact. We’re getting better at the process of sugarin’ as the years pass. Each year we seem to make one or two refinements that seem to revolutionize our lives. Last year it was the evaporator pan. This year, a length of irrigation pipe from the pasture that wasn’t being used. That very basic 200 feet of plastic pipe with a funnel duct taped to the end has spared me countless treks down the very steep and slippery forest slope with a full load of maple sap. 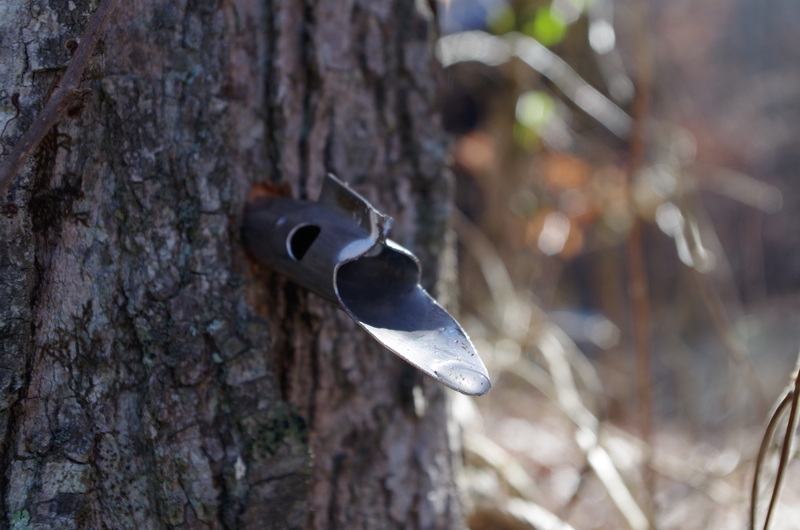 This year, the funnel-attached-to-the-pipe is kind of centrally located in the sugar bush and we merely have to traverse the slope a bit and dump buckets of sap in the glory hole of the funnel. Gravity takes care of the rest… directly into our storage tank. This makes me very happy. I’m a pretty cheap date. Amazing what joy I can garner from some black plastic irrigation pipe, a cheap-o plastic funnel, and some duct tape. In my opinion, that’s way better than a movie and some popcorn. And now, my friends, I’m calling it a day. 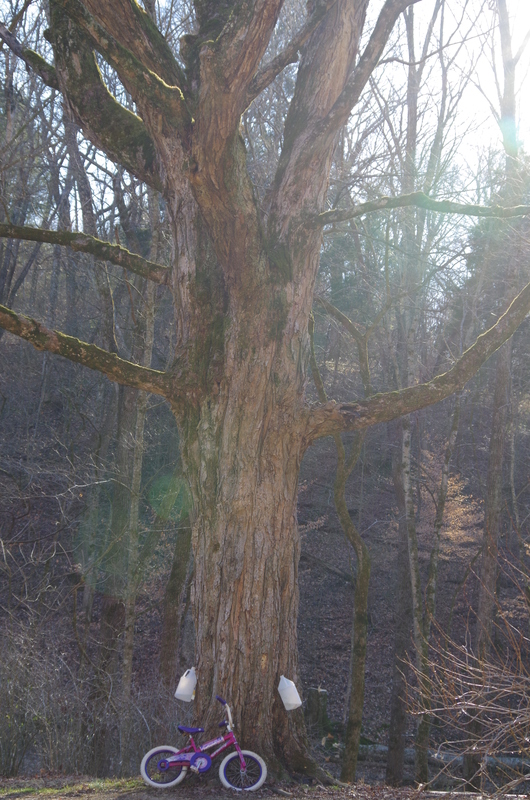 The sap is still running… but I’m fading. 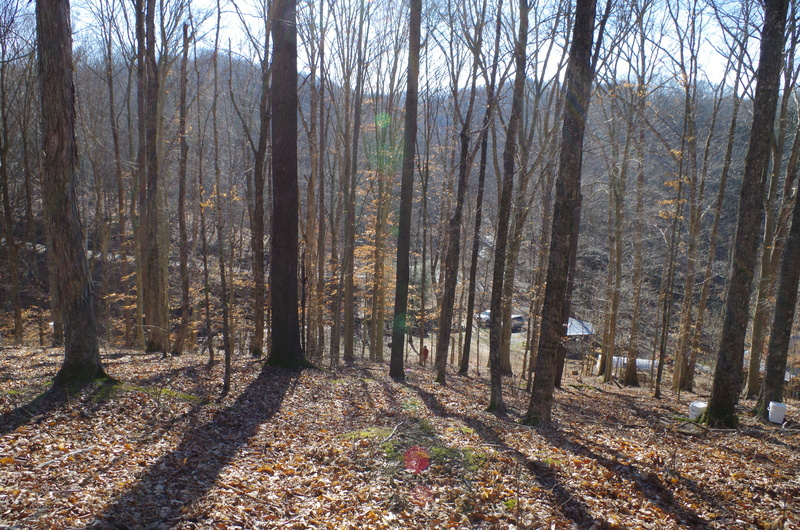 This entry was posted in cher's posts and tagged family, hard work, homesteading, maple syrup, seasonal living, seasonal work, spring, sugar maple, winter by cher. Bookmark the permalink. Very exciting! How much do you think you will have once it’s all done? Hi Stan… each year is different, depending on the weather. Here in Ky, our season is much shorter than up north in the more traditional sugaring states. I think this is why not too many folks make syrup around us. Last year we made about 8 gallons. Once I finish up our second batch today, I should have about four gallons of syrup so far. 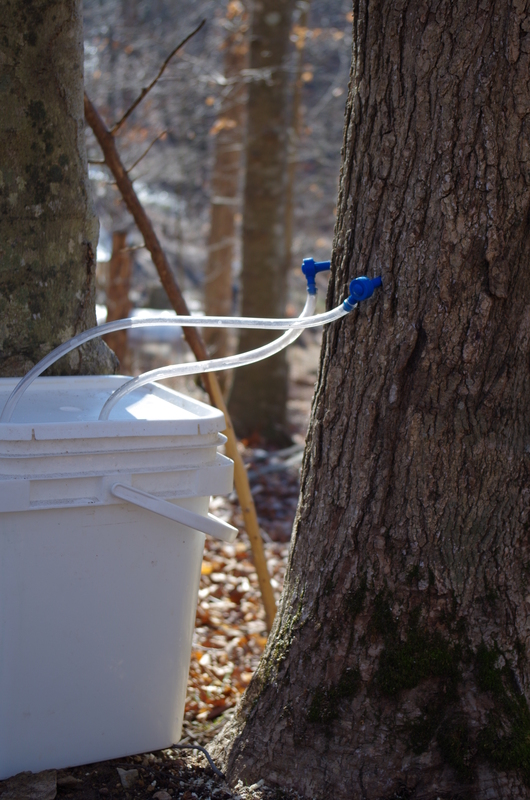 We still have a fair bit of sap to cook, and the taps are still flowing. My goal, which is fairly ambitious, is at least ten gallons!